In March 1916 the trenches in the Arras area, including those on the lower slopes of Vimy Ridge were taken over by the British. The area had been one of intense mine warfare between the French and Germans and this continued into 1916. Each side continually tunnelled under enemy lines in an attempt to create underground chambers which could be filled with explosives and fired destroying whatever lay above them. Some mines were exploded to destroy enemy positions above. On other occasions they were exploded to create a strongpoint out of the crater or to obstruct the enemy’s view through the debris created. 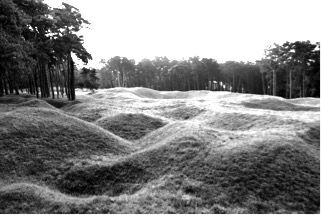 The craters still clearly visible at Vimy are evidence of the extent of mining in the area and the force of the explosions which took place. The chalk which lies under the ground around Arras made the area ideal for tunnelling. As well as mining, extensive networks of tunnels were created for other purposes. These tunnels eventually made up a system extending for many miles and included headquarters, hospitals and communication centres. Tunnel systems also allowed troops to move about in safety below ground and it was possible to accommodate 11,000 troops in underground barracks. The name of Vimy has ,however, been principally associated with the Canadians who fought here as part of The Battle of Arras in April 1917. The French and British had planned a Spring offensive for 1917. The French were to launch an attack South of the River Somme in an area known as The Chemin Des Dames, while the British were to launch an attack to the North in front of Arras. The British planned to bombard the German lines with a concentration of artillery greater than anything used previously, after which infantry were to assault the German lines. The hope was that the German lines would be broken by the British at Arras and by the French 80 miles to the South, which would allow the cavalry of both armies to sweep through and join up behind the German lines. A key objective in the British attack was the top of Vimy Ridge and this task was given to the Canadian Corps. The initial British attacks were a stunning success. The sheer weight of the artillery bombardment and German unpreparedness meant that when the British infantry attacked in rain, sleet and snow on 9 April, they swept over the German positions. The most striking success was the Canadian capture of Vimy Ridge. From the Eastern edge of the ridge, the Canadians stood and watched large concentrations of German troops, artillery and transport retreating across The Douai Plain. However, the initial success of the opening day was not continued. The Germans recovered quickly and began to bring forward reserve troops to halt the British advance. The usual problems of trench warfare, described in Deadlock on The Western Front, also came into play and the Battle of Arras became one of attrition in which the British launched a series of attacks hoping to wear the Germans down. No further ground of significance was gained and, after a month’s fighting , attacks came to a halt, by which time casualties had reached 150,000.